I'm very pleased to announce the Special Issue on Blastocystis recently appearing in Parasitology International - go here for the list of contents. The papers included in this issue represent the breadth of the contributions made to the 1st International Blastocystis Symposium, which took place last year in Ankara. A couple of review and opinion articles written by members of the Scientific Committee are accompanied by several articles outlining original research findings that were presented at the symposium. This special issue is particularly useful for younger researchers who wish to familiarise themselves with some of the methods that are currently in use in surveys of Blastocystis. Readers should not expect to find articles on Blastocystis in a microbiota context; nor should they expect to see data from seminal studies that challenge the view that Blastocystis is a possible pathogen. Nevertheless, there is an interesting opinion paper with the title "Eradication of Blastocystis in humans--really necessary for all?" Led by Dr Alison Jacob and Dr Graham Clark, London School of Hygiene and Tropical Medicine, our group just published an article on a comparative study of Blastocystis mitochondrial genomes. In general, mitochondrial genomes differ vastly in length, structure, and gene content across organisms, and by studying these genomes it has been possible to develop hypotheses on how these organisms have evolved including the adaptive/non-adaptive processes involved in shaping organismal and genomic complexity. Unlike most anaerobic eukaryotes, Blastocystis does not have true mitochondria but has mitochondrion-related organelles (MROs; also referred to as mitochondrion-like organelles [MLO]) that contain a genome. In the study in question, we sequenced and compared mitochondrial genomes from subtypes 1, 2, 3, 4, 6, 7, 8, and 9. All of them have the same genes in the same order, but two curiosities were noted. One gene, called orf160, as stop codons near the beginning of the coding region in most subtypes. A second gene, coding for ribosomal protein S4, lacks a start codon in some subtypes. In both cases, these characteristics would normally prevent a gene from being expressed, but because these genes are otherwise conserved and most of the gene is 'intact', it seems likely that the genes are functional. Ribosomal protein S4 is considered an essential component of the ribosome needed for protein synthesis in the organelle. How the genes are expressed to produce functional proteins remains a mystery, - just one more peculiarity of Blastocystis! In the growing pool of articles exploring relationships between intestinal parasites and gut microbiota, I was pleased to discover an article by Iebba et al. (2016) on "Gut microbiota related to Giardia duodeanlis, Entamoeba spp. and Blastocystis hominis infections in humans from Côte d'Ivoire". In this observational study, the authors used qPCR to detect groups of bacteria that are indicative of dysbiosis vs eubiosis, dysbiosis being a perturbed, imbalanced microbiota and eubiosis being a healthy, balanced gut microbiota. The authors found that individuals with Blastocystis and Entamoeba were characterised by eubiosis, while individuals with Giardia were characterised by dysbiosis. It says that samples (n = 20) were randomly chosen, but even so, the number of samples tested was low, and care should be taken when interpreting the results. The overall approach, however, is interesting, and somewhat resembles the work that we have been doing in our lab (ref). I also recently blogged about another study with a similar aim (go here to view the post). 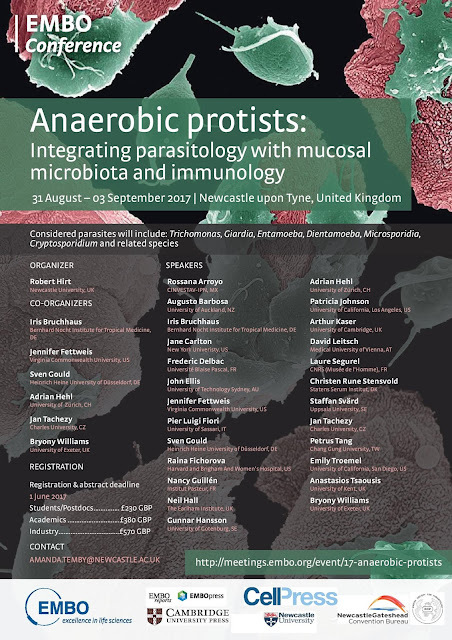 I would also like to bring your attention to the EMBO Conference "Anaerobic protists: Integrating parasitology with mucosal microbiota and immunology", which will take place in Newcastle upon Tyne, UK in Aug/Sep 2017 (image). I will be there doing my best to deliver a stimulating talk on current knowledge and advances in Blastocystis and Dientamoeba research. You can visit the conference website by folloing this link.